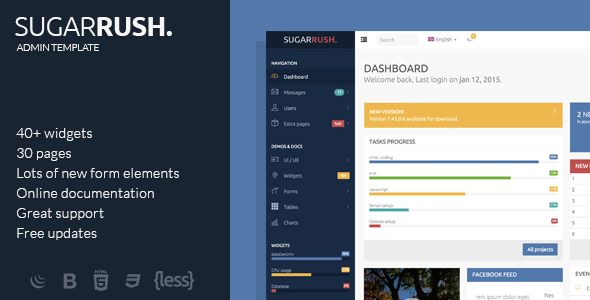 SugarRush is an admin template built with HTML5, LESS, Bootstrap 3 and jQuery. It’s clean design and 100% responsiveness makes it ideal for those managing their sites from their mobile phones or tablets. Regular updates: we will be updating the item with bug fixes and new features our customers ask for. So, if you want something added that is not in the package, make sure you ask for it in the comments section! The images in the demo page are not included in the package.